Have you ever waited for water to boil? It seems to take forever when you are focusing on it, doesnâ€™t it? This is how I feel, waiting for my new UC Verde test lawn to fill-in here in Los Angeles. 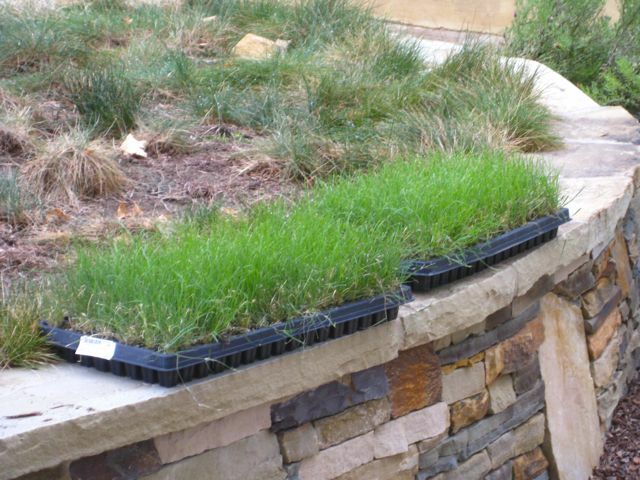 This drought-tolerant, â€œspecially formulatedâ€ buffalo grass for dry climate areas comes with many promises including a 70-80 percent reduction in water needs to keep it looking green and healthy. I canâ€™t wait to see if it lives up to its claims! Here are the plugs before planting. In all fairness to UC Verde grass, it does best with very warm temperatures and full sun exposure- at least 6 hours per day. The days are warming up, but Los Angeles has had a fair share of â€œJune gloomâ€ this month. This grass spreads via stolons and I see a few plugs breaking out of their small diameter area and reaching out slightly. The plugs are in good shape. Iâ€™m keeping them moist for their initial establishing period and will taper off the watering after a few weeks. There is another blogger, the Lazy Gardener who started testing UC Verde a few weeks ago and is ahead of me with the progress. Check out the Lazy Gardener blog for what I am hoping will be a preview of what is to come for me. Of course, if this lawn was a UC Verde lawn, I would stop them in a heartbeat! I enjoyed your music video- what an entertaining way to share a message. I will be posting more pictures of the UC Verde lawn as it grows in. I appreciate your insight and experience with the watering times as you are ahead of me in testing this same lawn. Thanks. Thanks for visiting Eden Makers! Your question is a good one. I can only guess that the majority of people who have a lawn in MEditerranean climate areas like mine, have a lawn out of tradition. Most people are not garden-savvy or aware of the alternatives to lawns which demand lots of water and maintenance. For me, lawns have their place in the landscape when they are actually used for playing, sitting, picnicking, etc. I’m not “anti-lawn” I’m pro “smart lawn” and water-wise gardening. Shirley–I know I come from the land of verdant lawns (except in August), but why lawns in a Mediterranean climate? Is it the useful aspect of the surface for games etc., or is the last vestige of the English landscape of the 18th century? Take and post lots of pictures, please. I’m already using less water than an established Bermuda grass lawn would – it’s weaned to watering every 3rd day, for 12 minutes total. I’m about to increase the days to every 4th day and increase the time to maybe 15 minutes. Shirley: Thanks for the promo on the music video. This will either boost my career to the stratosphere or finish it off once and forever! Great work you’re doing here getting the word out about water conservation and alternatives to our old-school suburban lawns.